ISLAMABAD, Pakistan (CNN) -- A moderate Muslim cleric who denounced suicide attacks as forbidden by Islam was killed Friday in a suicide attack on his mosque in Lahore, authorities said. 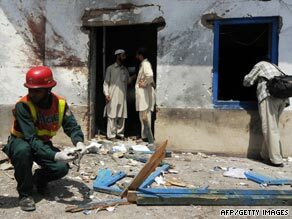 A Pakistani rescue worker works outside a damaged room of Jamia Naimia religious school. Sarfraz Ahmed Naeemi was the first imam in Pakistan to issue a fatwa, or religious edict, against suicide attacks in Pakistan. On Friday, a suicide bomber approached Naeemi as he left the Jamia Naimia Mosque and religious school. The bomber detonated his explosives, killing Naeemi and four others, police said. Another 10 people were wounded in the attack. Naeemi had recently received death threats because of his opposition to the Taliban and his support of the current Pakistani military offensive against Taliban militants, his son told local television. It was one of two mosque bombings in Pakistan on Friday, which has suffered a series of attacks in the wake of its ongoing military campaign against Taliban militants. A suicide car bomb exploded Friday at a mosque in a high security area of the Nowshera Military Cantonment near Peshawar in North West Frontier Province. At least three people were killed and more than 50 others were injured, according to local police official Manzoor Hussain. At least two of those killed were military personnel, a military source said. The attack occurred just after Friday prayers, while many worshippers were still inside the mosque. Most of those who pray at the Nowshera mosque are Pakistani military personnel. Many of the recent attacks by suspected Taliban militants have taken place in North West Frontier Province. A suicide attacker detonated near a police checkpoint in Peshawar on Thursday night, killing one person and injuring at least 12 others, police said. Peshawar is the capital of North West Frontier Province, where a coordinated suicide attack targeted an upscale hotel earlier this week, killing nine people. The attackers shot their way onto the grounds of the Pearl Continental Hotel, which is often frequented by foreigners and diplomats, and set off a vehicle bomb on Tuesday. Two United Nations employees were among those killed. Pakistan's military has stepped up its offensive on Taliban militants in the Bannu district of North West Frontier Province, which a military spokesman said is a "notorious hideout" for militants. The military on Thursday dropped leaflets over parts of Bannu district, warning civilians to leave in the wake of its operation. The Bannu offensive has resulted in the deaths of 34 "terrorists," while three others were apprehended, the military said Thursday. One civilian was killed in a militant rocket attack in the city of Bannu, according to the military. Pakistan's military began its operation to clear militants from the district after tribes in the region refused to hand over those responsible for the abduction of dozens of Razmak Cadet College students, who were seized along with their relatives and teachers on May 29, military spokesman Maj. Gen. Athar Abbas told CNN. One of the tribes, Jani Khel, has also been linked to numerous militant attacks on military bases in the Bannu area, Abbas said. He described Bannu as a "known and notorious hideout" for militants. The Jani Khel tribe is located in the area of Bannu where the military dropped leaflets warning residents to leave. Military sources have also expressed concerns that the tribe may have helped plan a series of recent attacks on civilian targets in North West Frontier Province. Residents in the province's Upper Dir district continued their assault on Taliban fighters with the support of the Pakistan military, a police official said Wednesday. Outraged over Friday's mosque bombing in Upper Dir, residents formed a "lashkar," or militia, to fight the Taliban. CNN's Thomas Evans, Ingrid Formanek and Journalist Nasir Habib contributed to this report.